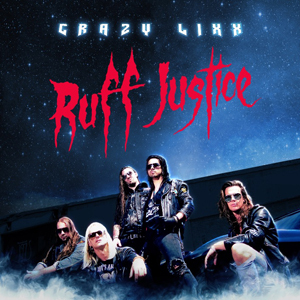 Frontiers Music Srl has announced the upcoming release of CRAZY LIXX's new studio album, Ruff Justice on April 21, 2017. The new record celebrates CRAZY LIXX’s fifteenth anniversary as a band and offers ten hair/sleaze/80's metal gems that harken back to the height of the hard rock era. The new songs draw inspiration from not only music, but also from 1980’s horror and action flicks and stand as a glowing reminder that pretty much everything was better in the 80’s. With its big choruses, memorable hooks and riffs, impressive guitar solos, and a massive production by Danny Rexon and Chris Laney, this album is sure to resonate with old fans and new listeners alike. “We’ve tried the same ‘all killers-no fillers’ approach that we’ve gone for on our previous albums, but this time, more than ever, I think we’ve come close to that vision,“ says lead singer and producer Danny Rexon. Ruff Justice will be the first CRAZY LIXX album to feature the new lineup with Chrisse Olsson and Jens Lundgren handling axe duties. “It does bring a certain feel to the album that I think we’ve been missing since the days of New Religion (2010). Once again the whole band pulls in the same direction and the end result, I believe, will be very well received among those who hold New Religion in high regards. If I would compare Ruff Justice to any of our previous albums, that would have to be the one,” Danny Rexon concludes. The album also includes three songs which appear on the Friday The 13th videogame soundtrack: “XIII”, “Killer“ and “Live Before I Die”. Friday the 13th: The Game is an upcoming survival horror video game developed by Gun Media and IllFonic, and published by Gun Media. It is scheduled for release in early 2017 for Microsoft Windows, Xbox, and Playstation 4. With Ruff Justice, CRAZY LIXX have raised their game tremendously! As always, their live shows in support of this album are going to take no prisoners! Don’t miss them while they’re on the road! "Shot With A Needle Of Love"
"Kiss Of Judas" 10. Live Before I Die"